David Parry has a huge and varied repertoire, both operatic and symphonic. Renowned for his conducting of the Italian bel canto repertoire and his championing of rarely-heard operas, he is equally at home with contemporary music, and has given numerous world premières. His conducting of staple repertoire operas is also celebrated and he is particularly known for strong collaborations with great stage directors. In the operatic field, he is passionate about unity of performance: singing, physicality, use of text, the orchestra as the vehicle of expressive support, the visual element, the concepts of production, all these things are part of the whole and interdependent. There is no possibility of separation. In the performance of symphonic repertoire, the playing must sing. Music comes from singing: without our ability to sing there would be no music. There is no room for the mechanical: every phrase, even the simplest accompaniment, must be conceived and realised. For him an extraordinary piece of advice, given to him as a young assistant, still resonates: We conductors must remember that every musician started out because he loved music so much; our job is to reawaken that love. Parry’s conducting of the bel canto composers is second to none. 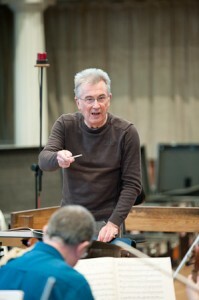 David Parry conducts with head-dizzying zing. Copyright © David Parry 2019. All Rights Reserved.